Attending to relationships more helpful than focus on emptiness! We may not be solid, separate entities but we sure are moving in an ocean of relationships! We are communities of interbeing, on every level of our experience, inner and outer, and the great delusion is the belief that we are isolated, alone and out-of-place in our world. We are most subject to this delusion when we are feeling depressed, anxious or powerless but this sense of separation and individuality is pervasive at all times and tends to be strongly supported in modern Western and consumer-driven cultures. As many of us “good Buddhists” know, this concept of separation, one from the other, this from that, is seen as fatally flawed and the manifestation of ignorance that causes so much pain and suffering in our lives. So, imagine my relief, when at the eight day retreat with Tarchin Hearn that I have just returned from, he spoke of little else than the complex weavings of inter-relationship – interbeing – that is our experience, moment to moment, past, present and future! I don’t think he spoke once of the concepts of ‘no-self’ or emptiness. And yet his colourful, poetic descriptions of how we and our present environment have been, and continue to be shaped by the flow of learnings from past and present teachers; the genetic and historic ground of our ancestors, with all their many talents; and the ecological ground of immeasurable, inter-relating life-forms and elements, speaks powerfully of the mystery of no separate self and no separate entities, described as anatta and often translated as ’emptiness’. What a full emptiness! On this retreat, Tarchin invited us to remember the forms of the many teachers and beings that have inspired, supported and shaped our feelings, perceptions, impulses and consciousness just as we, in turn, are inspiring, supporting and shaping all around us. Through this exploration he encouraged us to see the continuity of the creative action of interbeing that is a continual flow of relationship, leaving no room for separate existence. living around you and through you. are the ground and source of true refuge. And now, here I am back at home, sitting on my swing seat contemplating some of the communities of beings visible in my immediate surroundings. Below me, enjoying our pond, is a family of ducks. 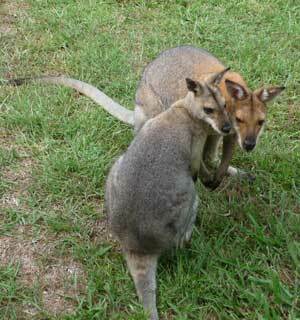 A little closer, I can see two wallabies (frequent visitors to our place) spotted in close relationship. Closer still, hanging from the deck’s rafters, are three strings of communities of native wasps that seem to be lazily but continually multiplying and, in their strange, slow-motion way, demonstrate a truly laid back building of community! All around me there are communities of birds, butterflies, moths, spiders, ants, lizards and frogs – all easy to see – and these are just a fraction of the many beings living and dying in my immediate environment. If I include the insects, mites, bacteria and flora living in and on my body, it is clear that the “I” that I have constructed is a very small part of the picture even before closer examination reveals this “I” as having no inherent substance! And so these reflections on some of the non-human forms of community that I belong to give some small indication of the enhanced sense of interbeing that I have gained from this retreat. The reverberations will go on developing – like the ever-widening circles from a stone thrown in the water – and the singing of thanks and of joy are part of these reverberations. If anyone else has reflections to share on their sense of interbeing, we would all love to hear them! Hi Larry, I love your definitions of love and respect. Do you mind if I use your definition of love in a workshop I am planning later in the year? The marinating of every cell in our body – and all bodies – with love is an awareness that can support us even when we are suffering from the loss and grief following the death of a loved one. Always we can experience love and this is a truly supportive knowing. Thank you so much for your inspiring contribution to our exploration of relationship. Love attracts every part of every cell in our body to every other part of every cell in our body and underlies the relationship of every cell in our body to every other cell in our body. It is greater than a force of attraction, it is a field of care that flows through all beings. As such as long as we are alive we can’t really say I love or I don’t love. We can only say I experience love or just at this time I am not aware of the experience of love. Like a fish in the ocean, love is all around us. We may feel attraction to others or not but love is still there. Inside our minds we form the words to speak and in so far as we can grasp, the experience of reality. It is truth to us. In translating it into words we run the rainbow of all aspects of that experience, the memories and the present through the sieve of a dictionary of common meaning with others, and we call that a language. Immediately in forming the words, something is lost of the experience. Then someone else hears the words and repeats the process in reverse, running the words through the sieve of the dictionary of understanding, relating the results to their sensation of those words in the memories of experience deep in their being. 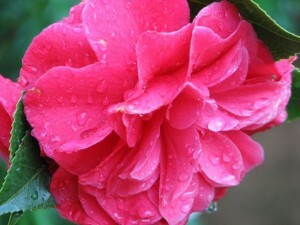 They do this in their care toward others, to elicit a common experience from those seeds in their own mind and being. Knowing this; we are encouraged to take a second look at what we are about to give in words, gestures, expressions, gifts and all other forms of communication. We do this in order to make sure that it is as loving and true as we can make it. This taking a second look or a third if necessary is literally respect. From Latin: Re(to do again) Spect(to look). I agree with my old friend Tarchin, the “one” in “One-ness of mind” is as large, or larger, than all of life – not just this body and mind.